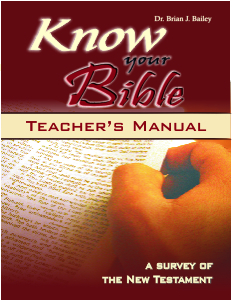 This teacher manual is based on the book, Know Your Bible, which shows that as believers, it is vital that we are well-grounded in the truth of God’s Word in order to stand strong in the coming days. Having a comprehensive overview of the Bible is a must, and it will become a reality through reading this anointed book. In this survey of the 27 books of the New Testament Dr. Bailey focuses on key concepts in each of the studies, and has interspersed many wonderful insights from his vast experience. Through this well-written survey, you will easily grasp the salient truths that flow through the pages of God’s Book and gain a greater desire to study His Word.